Enjoy all the comforts of a real mattress on your boat with one of our custom made foam mattresses! You can select from genuine PostureSense memory foam, Natural Latex, an all natural foam used in our organic mattresses, or our sailboat mattress foam. Boat mattresses made from any of these premium foams can be constructed with a firm supportive base layer that offers proper spinal support, and a softer contouring top "comfort" layer that increases circulation, resulting in a deeper, more restful night's sleep. These foam mattresses come with excellent warranties and can last 20 years or more without losing (more than 10%) firmness or forming depressions. 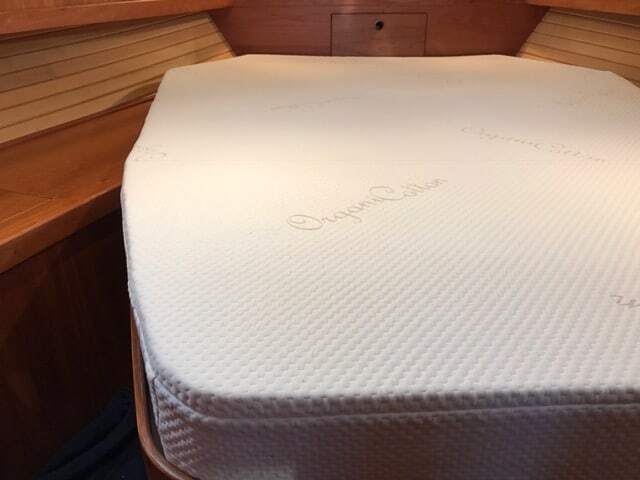 We can help you design and customize a boat mattress that will offer years of comfort and deep sleep. The thickness of a boat mattress is often restricted to 4"–6" (10–15 cm) and will often serve the dual purposes of sleeping and sitting. Therefore, the best performing, and most comfortable, option involves the combination of a firm, supportive base layer that is usually 3" (8 cm) topped with a comfort layer of 2"–3" of higher quality softer foam. At your request, we will bond the layers together to prevent shifting. Perhaps your boat mattress is too hard or just old and in need of some upgrading. In that case, try one of our foam toppers. We can customize any standard sized mattress topper for an extra $10–$25 labor (simply make this request by using the "Add comments" link found in the shopping cart). This cut-to-size option is important since it is often less expensive to order a standard sized foam cut down to size. This particularly applies to our natural latex foam and memory foam toppers. If you are unsure of the best option, please contact us. We are happy to help you create the most economical solution. Our upholstery foam page sells raw foam sheets for any v berth mattress at a substantial discount to custom cut pieces. It's worth comparing prices. For memory foam and natural latex foams visit our foam toppers page and natural foam pages. Also check our clearance section. To generate a quote, all you need are your dimensions and to pick (click on) a shape below. Keep reading below for more great information on making a wonderful boat mattress. If you have questions or need help, please call one of our product specialists at (415) 503-1188 to help assist you in building the boat mattress of your dreams! Latex is a certified 100% natural boat mattress foam and resistant to mold and mildew. Memory foam is a great top layer for comfort but needs to be used with firm bottom foam for support. Both memory foam and conventional foam cost less than natural latex, but are synthetically derived byproducts from oil. You can also browse discounted boat mattress foams in our clearance section. Boat mattress V berths often need a hinge to allow easy access to the storage below. Our bi-fold hinge mattress provides a simple solution. Our more luxurious hinge option is a quilted top that covers the split in the foam beneath. Most cushions do not require a pattern if they match one of the shapes above. However, if you want us to design a mattress to fit your boat, you will need to prepare a pattern for us to work from. Take a minute and review how your existing cushions look. This is your chance to correct any gaps and make improvements. Using pattern paper or fabric, simply cut the pattern to the exact size desired. A pattern drawn with precision will result in a more exact fitting cushion. (For local customers we'll come and template every cushion needed for a $150 fee.) Please indicate the top of the pattern by writing "This side up." Indicate which side(s) should be used for zipper placement and stripe direction. 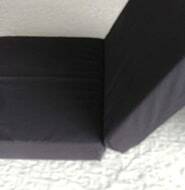 Large v berths and cushions should have a zipper on three sides to make it easier to insert the foam cushion. We recommend placing the zipper on the side facing the boat hull, not under the cushion. This placement hides the zipper from view and prevents it from buckling. To place an order, all you need are the largest dimensions (thickness, length, and width) from your old boat mattress or custom shape. Enter the dimensions into our pattern shape. 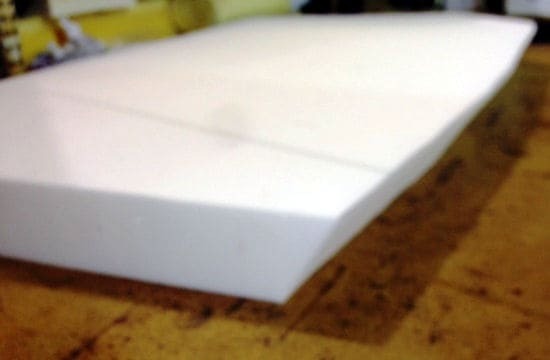 You can cut foam for a v-berth mattress using less foam. If you were to simply cut your boat mattress pattern from a large block of foam it would look like this. We sell foam by volume, so using less foam will cost less. You can save foam and cost by laying the v-berth mattress pattern out like this. You must use the larger top pattern if there is a bevel. The center cut out will be seamed together. Separate each half of the v-berth mattress pattern by 1.5". 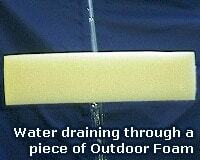 In this example, the finished cut marine mattress foam looks like this. You can see a bevel was done as well. Add a layer of polyester batting to the bottom of the foam to add a layer of ventilation. This will help prevent the growth of mold. You can select this option during the process. Sunbrella® is our most popular marine mattress fabric line. Sunbrella® is not susceptible to fading and comes in wonderful upholstery textures like chenille, jacquard, linen, and canvas. Browse this line by choosing a shape above and entering sizes. This fabric is thick and soft, and feels like boat mattress material should. It is a machine-washable, poly/cotton blended fabric called a double knit. It is so thick that it will help hide the split if you need a hinge in your berth. We sew matching Sunbrella® to the bottom and hull side of each cover. It will not form a body depression or dip over time. Boat interiors are frequently moist. This moisture gets trapped between your mattress and the platform below. To help avoid problems with mold or mildew, air your mattresses or cushions outside in the sun every couple of days, but don't remove the covers. When you are not using your boat, store your mattresses vertically in the aisle. For added protection, you can sprinkle anti-fungal powder (found at most drug stores to treat conditions like athletes foot) on the platforms below your boat mattress, as well as on the bottom side of your marine mattress. While ordering your boat mattress, you'll have the option to add cording. For the 2- and 3-piece v berth consider adding the comment: "cording should go on the edges and not the center pieces." You may feel the cording in the middle if it's present. Marine mattress material should be good quality. A v berth mattress has the shape of a "V" and is used as a sail boat mattress. Ventilate your marine mattress to prevent mold. We recommend adding sail boat mattress polyester batting to the bottom side of the marine mattress. Cover the v berth mattress foam in your marine mattress to protect it. Using a good v berth mattress foam in your marine mattress will prevent the marine mattress from softening over time. When you buy inexpensive v berth mattress foam for your marine mattress don't be surprised when your sailboat mattress fails. We custom see marine mattress cases. Our sailboat mattress is free of harmful flame retardants. We also custom sew sheets and protectors for any shape sail boat mattress. We warrant our marine mattress according to the quality of foam used and the fabric chosen.